Cosecha is a non-violent movement fighting for permanent protection, dignity, and respect for the 11 million undocumented immigrants in the United States. 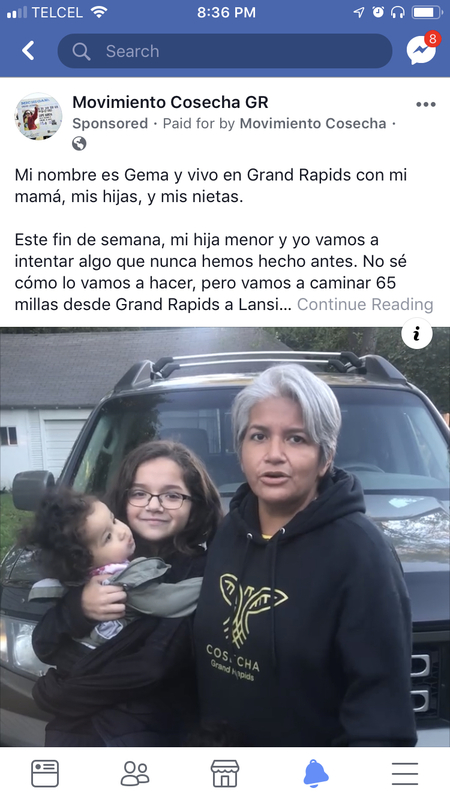 In October of 2018, they planned a 65-mile pilgrimage from Grand Rapids to Lansing to demand legislative changes that would allow undocumented immigrants to get a driver’s license in Michigan. One of Cosecha's key audiences is Spanish-speaking moms and grandmas. "These are the women who sacrifice for their family and their community. They are the people who work with others to get things done in the immigrant community,” said Alejandra Cruz, an organizer with Cosecha. Cosecha organizers have learned that traditional online organizing tactics like petitions and broadcast emails aren't an effective method to reach this demographic. Over the past two years, the Cosecha team has been a leading innovator in using new tactics and channels to reach this demographic via Facebook Lead ads, Facebook Live broadcasts, WhatsApp, and peer-to-peer text messaging. One of the ads used to recruit new supporters to engage with the page on Messenger. People could also opt-in to Messenger broadcasts by commenting “licencias” and other keywords. A few days before the kick-off of the pilgrimage for driver's licenses, a team from Cosecha (Christine Miranda, Patricia Murphy and Arielle Clynes) and a team from PowerLabs (Thaís Marques and Randall Smith) met to discuss the opportunity of using Facebook Messenger as a channel to recruit people on Facebook and move them to offline action. Our theory was that if we offered women an opportunity to receive behind the scenes Spanish-language updates on the pilgrimage, they would opt-in to receive messages from us and would want to be involved in the campaign going forward. We thought that Messenger was an ideal channel, both because our audience is on the platform and because Messenger allows us to combine broadcast messages via a bot with two-way conversations with an organizer to move people to deeper levels of engagement at scale. To build our audience, we ran ads that featured Gema, a Cosecha leader in Grand Rapids, describing the journey she was about to undertake. We also broadcasted updates on the walk using Facebook Live and asked people to comment on the post with a keyword. After the viewers had commented with the keyword, they received a Facebook message from Gema asking them if they wanted to receive updates during the pilgrimage. We then sent people daily text and video updates via Messenger and asked people to share the content with their friends. One of the videos that we shared via Messenger. Over 250 people opted-in to receive messages from the Facebook page in five days. 30% of people told us they wanted to be involved in local organizing. 20% of people said they wanted to donate. 90%+ of broadcast messages were opened. The average advocacy organization has an email open rate of 16%. The average click-through rate was 24%. The average advocacy organization has an email click-through rate of 2.5%. A message from a pastor that was sent to people who had mentioned God in a reply message. We had more people say they wanted to be involved in local organizing than we expected. Next time, we’ll have several in-person events on the calendar so that we can funnel people to opportunities to connect with others in their community, learn more about the movement and join a team soon after their first interaction. 20% of people said they wanted to donate, but we received very few gifts. We are following up with those who said they wanted to give in order for us to try to learn why people didn't contribute and, ultimately, help them complete their donation. People shared, unexpectedly, heartfelt and personal stories in replies to broadcasts. This helped us identify the community members who resonated with our messaging and cause and follow-up with them with one-to-one messages from an organizer. In the future, we are considering making it more clear which messages are broadcast versus those from an individual to not mislead recipients. We can turn natural language replies into data to inform strategy and segment supporters. Many people replied to the broadcast messages with references to God. We set up keywords to automatically tag those who said "Dios bendiga" (God bless you) so we could send them content related to religion. For example, we offered to send them a video of a pastor speaking at one of the stops on the pilgrimage. 71% of the recipients asked to see the video, and 58% of them said they watched the video. The two-way nature of Messenger and the feature set of Messenger bot platforms allow for segmentation at scale based on natural language replies in a way that isn’t feasible with broadcast email channels or peer-to-peer texting. Sign up for the Facebook Messenger course wait list to be the first to know when the course opens. Enrollment is limited and opens in April. Done! I’ll let you know when the course registration opens.